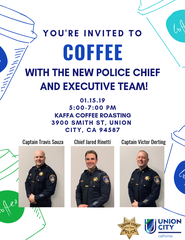 You’re invited to share a cup of coffee with the new Police Chief and his Executive Team! This event will take place on January 15, from 5-7 PM at Kaffa Coffee Roasting. Police Chief Jared Rinetti, Captain Travis Souza, and Captain Victor Derting have served the residents of Union City for a combined 60 years. Join us to welcome them into their new leadership positions and learn more about their vision for the future. You can also read Chief Rinetti’s message to the community at https://www.unioncity.org/265/Chiefs-Message.